Artist Dalya Luttwak takes hard steel and transforms it into the sinuous shapes of roots. 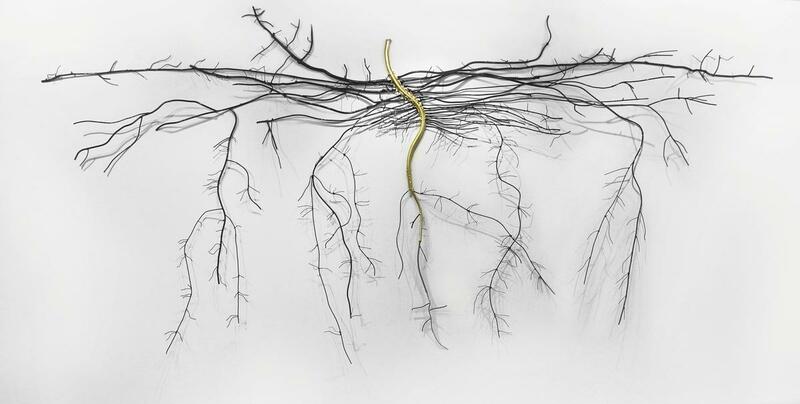 For a recent show at the Greater Reston Art Center in Virginia, Luttwak chose as one of her subjects the root system of Cannabis Sativa. Cannabis, a plant of many uses, which evokes strong and complex responses and touches on so many areas of our culture – industrial, medical, recreational, and criminal – is an irresistible subject for art. Beyond the secrets of plant life, however, this sculpture, and many of Luttwak’s other works, strongly evoke the brain and nervous system. Seeing the roots of the Cannabis Sativa as a metaphor for the paths of chemical stimulation or even of our tangled attitudes to drug-taking, elevate and deepen our response to this deceptively simple art. You can see more of Dalya Luttwak’s work on her website. This entry was posted in The Art of Science and tagged cannabis, sciart, Sculpture. Bookmark the permalink.